Beat the egg yolks and sugar in a large bowl until fluffy and pale yellow. Stir in the mascarpone and Amaretto. Gently fold the whites into the mascarpone mixture. Set aside. Put the crumbled cookies in a medium bowl. Stir in the shot of Amaretto (just until moistened, you don't want them soggy). Add a dash of cocoa powder. Divide the cookie crumbles into the bottom of 4 glasses. 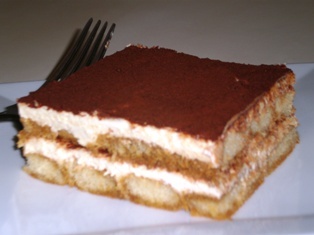 Divide the mascarpone cream evenly among the 4 glasses. Top with a sprinkle of cinnamon and shaved dark chocolate. Garnish with a few berries and a sprig of mint. Serve chilled or at room temperature. 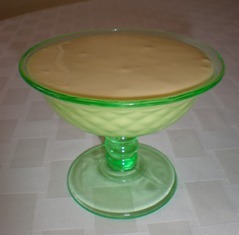 The mascarpone cream contains uncooked eggs. Because of the risk of foodborne illness caused by salmonella bacteria that may be present in raw eggs, consumption should be avoided by young children, elderly persons, and persons with weakened immune systems or debilitating illness. 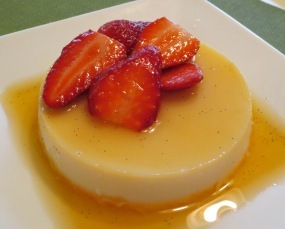 Mascarpone cream has a rich, smooth texture similar to zabaglione. Serve it alone as a simple spoon dessert, or add it as a delicate accompaniment to a slice of cake or pie, as in Italian Apple Pie with Mascarpone Cream. 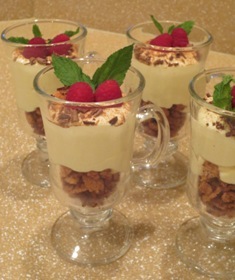 In this parfait recipe it is layered with crumbled cookies but you could also layer it with fruit or Nutella or flavor the cream with another liqueur or extract.